I was a Boy Scout, and later worked for the Boy Scouts to get myself through school. 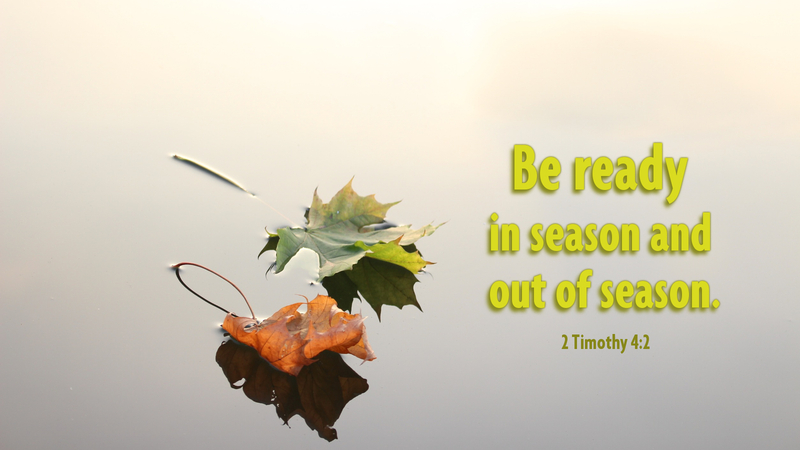 As you may know, the Scout motto is, “Be Prepared.” Those two words are a perfect summary of our reading from 2 Timothy for today. We are to “Be Prepared” to share the truth of the Gospel with others through worship, Bible study, and in our daily conversations and interaction with others. But how do we become prepared to share Christ with the world around us? As we take time to read God’s Word, hear the warnings of God’s law, remember Jesus’ life, death, and resurrection for us, and pray, the Holy Spirit renews us each day, and empowers us to live our lives in ways that bring Christ’s love and forgiveness to those we encounter on a daily basis. As we do, we do so patiently, knowing that the power of the Gospel lies not in us, but in the Holy Spirit working through the Word that we share. May God bless your study of His Word, allowing it to transform you into a person who shares Christ in what you say and do with those whom God places in your daily life. Prayer: Lord Jesus, thank you for your life-giving Word I find in Scripture so that I can be assured that your gifts of forgiveness of sins and eternal life are mine through you, and so that others may come to learn of you through my words and deeds. Amen. Today’s devotion was written by Christopher Martin, Pastor of Emmons Lutheran Church, Emmons, MN.